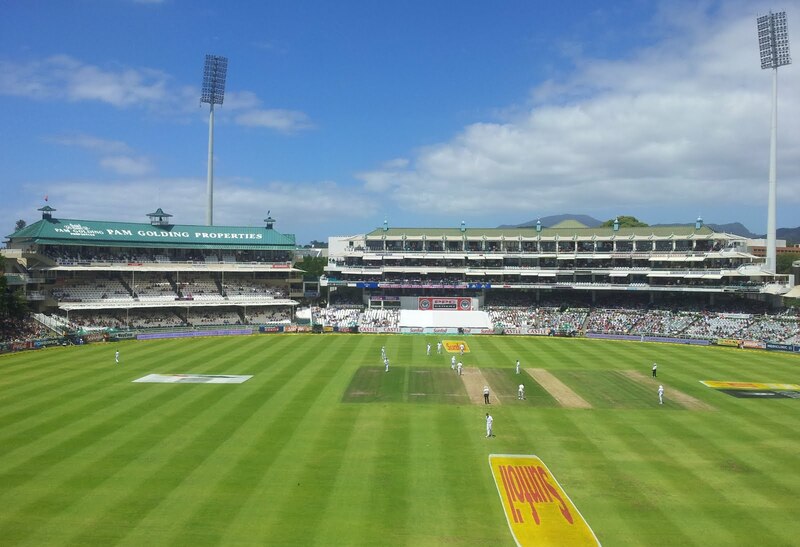 Vernon Philander is a one man wrecking machine on a pitch like this. Some of those deliveries moved so sharply that the batsman had no chance, but others moved just enough that the batsman didn't play and miss. New Zealand will be pleased that they have made it past 26. This time it was Dale Steyn's turn. The ball he got Bracewell with really deserved the wicket of a better batsman. There has been some bad shots, but mostly some very good bowling. One of the problems with inswing bowlers is that they can be expensive if they stray in their line. New Zealand have shown that quite clearly. They were always going to miss Tim Southee, but this should have been a good pitch for Bracewell. Instead South Africa have totally dominated this mini-session, just like the other two. Finally New Zealand managed to hold their own in an hour. James Franklin is coming off a longer run up, and is looking almost like the bowler he was when he first broke into international cricket. Amla played a peach of an innings. Sometimes a player looks like he is batting on a different pitch to everyone else. That was Sangakkara in the Boxing Day test and it was Hashim Amla today. He really is a phenomenal player. Another dominant hour by South Africa. It is hard to remember any day in a test match that has been as one sided as this. Perhaps the third day of the New Zealand-Zimbabwe match in Napier last year. Either way there is a big difference between the two teams on today's evidence. The only bright spot for New Zealand has been the bowling of James Franklin. While Franklin is not looking like a world beater, he is bowling much better than he has in a test for a long time. Alviro Petersen brought up a well deserved hundred. A fine knock on a difficult pitch. This should go down as one of his best ones in his career. That was probably the best hour of cricket of the test. Good bowling, batting and fielding, finally. For the majority of the rest of the day there was only one side playing good cricket. New Zealand finally won an hour. They probably need to win about 5 more in a row to get even close to being level. How South Africa handle the new ball will be the point of interest in the next hour. If Boult can find some swing with the dispersing cloud cover then New Zealand could wrap up the tail quite quickly. An even hour, but it could have been New Zealand's. They decided to not refer a lbw decision, which turned out to be plumb. AB de Villiers has looked fantastic with the bat, and Trent Boult has started to find some movement. An interesting decision from McCullum was to bring on Jeetan Patel with a fairly new ball. He managed to create some pressure, almost picking up a wicket in his first over. It may have just been a pre-break change to try and disrupt the batsmen's concentration, so it will be interesting to see if McCullum persists with it. It seems like a very good declaration from Smith. There is still some life in the pitch, and clouds overhead. Some of the balls are really doing crazy things, particularly when Philander is bowling. I actually think Kallis is going to be the most dangerous bowler today, if he gets the ball. This was an absorbing hour of play. Test match cricket at it's best for the purists. It was a battle of wills and wits. The South African bowlers were bowling in good areas, and the New Zealand batsmen were making an effort to not play anything they didn't need to. The decisive moment of the hour was Kallis getting Williamson to play away from his body with some clever bowling. He first bowled a ball to encourage Williamson into playing a shot. A short ball just outside off stump. Williamson played it through the covers for 2. Next ball Kallis bowled one a little wider and a little quicker, and Williamson fell for the trap. He's a good young player, and he learns well, but he was out-foxed by the veteran there. New Zealand are putting up a good fight, but South Africa are marching assuredly towards victory. A fantastic partnership between McCullum and Brownlie well and truly gave this hour to New Zealand. They put on 89 off 81 balls in a fantastic counter-attack. Brownlie's innings is reminiscent of the way he played in Brisbane a year ago. He probably doesn't really want to get a reputation as being good when the team is getting thrashed. 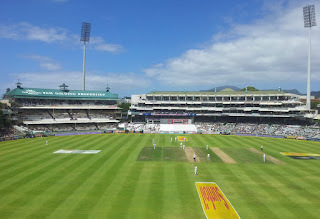 What a great day of cricket. Unfortunately it was totally ruined by yesterday's mismatch. New Zealand will be hoping to wake up to clear skies tomorrow. The game is really just about how South Africa win it, and how well the New Zealanders recover. At the moment they are sending a signal that the next test is going to be worth watching. New Zealand made it through an hour without losing a wicket. However there is a point where game is really just going through the motions until the new ball arrives. Kallis might still be a handful in this last hour if they give him the ball. That would have been New Zealand's hour, until Brownlie hit the new ball down Robin Peterson's throat. It was a terrific innings from Brownlie, who came out and really counter attacked yesterday afternoon, before consolidating in the evening. He brought up his maiden ton with a 6, and actually went from 92 to 104 with 2 sixes in 5 balls. This match is still South Africa's (it would require something incredible for there to be any result other than a South African win) but New Zealand have competed well in days 2 and 3. South Africa are starting to turn the screws. Philander has found the seam of the ball, and is starting to nip it around. It sounds very simple, bowl the ball at a reasonable pace, put it in the right area on the pitch and hit the seam, but nobody other than Philander does it so consistently. A brave effort from New Zealand, but they were never going to be able to make up for the first day. The final act of the match probably summed up New Zealand's test, with Chris Martin being run out needlessly. It appears that he can't even bat from the non-strikers end. There are some positives to take from the match for New Zealand, but not many. Brownlie, McCullum and Watling were the stand out players with the bat, and Boult and Martin with the ball. The man of the match was Vernon Philander, and he really sewed it up in the first hour. He could have gone to sleep under the stands for the rest of the match, and he probably would have still deserved it. Steyn continued his love of playing against New Zealand, picking up his 50th wicket against the one opponent. New Zealand are normally better in the second match of a series. They will need to be a lot better in Port Elizabeth to avoid humiliation again.